Product prices and availability are accurate as of 2019-04-19 17:22:53 EDT and are subject to change. Any price and availability information displayed on http://www.amazon.com/ at the time of purchase will apply to the purchase of this product. This Parker 14A miniature series three-unit combination compressed air filter/regulator/lubricator (FRL) is for decontamination and air preparation in a compressed air system. 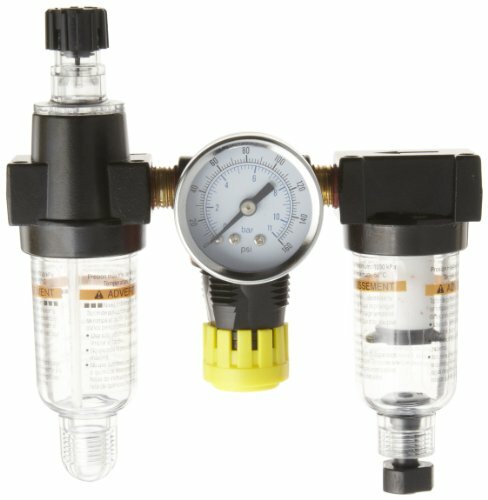 This three-unit module combines a filter, regulator, and lubricator (FRL) for space-saving installations. It has a solid control piston with a lip seal, which extends the life of the unit, and a deflector plate with a shroud swirls the air stream, ensuring that water and dirt are properly separated. 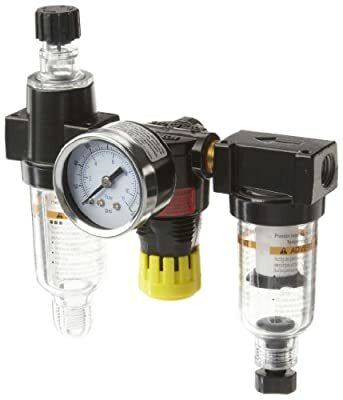 The regulator can be mounted with the knob in the up or down position to suit specific installation requirements, and it has male National Pipe Taper (NPT) threads for connecting to female threaded pipes. This filter is suitable for use in manufacturing and automated production environments.